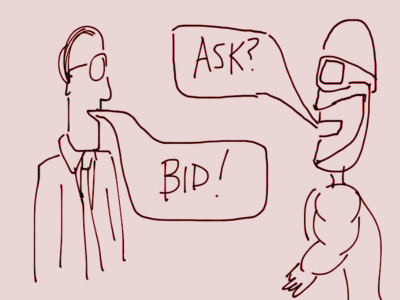 A good way of looking at any customer purchase is by analysing it using a Bid-Ask Model, where the customer’s Ask has to be matched with the business’s Bid to result in a transaction (just like a stock market transaction). The customer Ask is the value a customer requires to make a purchase and the business Bid is the value which is offered by the product/service the business is selling. This concept is particularly interesting and useful for early stage companies and startups as these businesses are not or less sure about how potential customers will accept the product/service offered by them. So the concept seems simple. However, calculating the same is the tricky part. So let me try to define the terms in more detail. The Customer Ask – This is the value the customer is looking for before buying the product or service. Any value under this value might not be enough for the customer to switch from the current solution he/she is using. To calculate this, we need to start off by identifying the best current product/solution which customers are using. The best way to identify this is by looking at the market shares of various products in your space or by simply asking the customers themselves. In addition, we would also need to calculate an additional factor, i.e. the Spread. The Business Bid – This is the value the business’s solution offers to its customers. Now that the concept and the terms make more sense, how do we go about calculating the bid-ask for any business? What are the various features which add value to a product and how much value does each hold? Since the customer has to buy the product, she is the right one to ask. For a startup, asking some potential customers (through family, friends, communities, online groups, social media etc.) to fill a Survey or participate in a Focus Group Discussion would be a good idea. It makes sense to ask potential customers and not existing customers as the latter are already buying your product. These inputs will then need to be used to calculate the Ask of the customer and also the Bid of your business.